Director of The Grand Wedding Show, Lisa Charteris, tells us her top 11 reasons the Grand Wedding Show is the bridal event to attend. Scroll down to learn how to win tickets! The countdown for Auckland’s Grand Wedding Show is on! Held at the Sky City Convention Centre on Sunday October 2nd, this is the ideal opportunity to gather ideas, samples and expertise to help you get those weddings plans underway or make those special finishing touches. We had a quick chat with show director, Lisa Charteris, about her top eleven reasons the Grand Wedding Show is the event for brides. All brides dream about their wedding, but most are not experienced at planning the details. Attending a bridal show will expose you to the many facets of planning a wedding, whether you’ll be planning it yourself or hiring a professional coordinator. With so many wedding professionals together under one roof, you will have the opportunity to meet and talk with them in a very short amount of time. 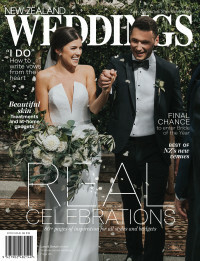 Get a feel for what each wedding company has to offer, see if your styles match, and whether your personalities 'click'. The Grand Wedding Show is an excellent place to find photographers, cakes, florists, videographers, entertainment, stationery, bridal gowns, mother of the bride wear, reception venues, honeymoon destinations, make-up and hair stylists and much more. A wedding show allows brides to see a sampling of their work, pick up brochures, book consultations, taste some of their food and even try on some gowns! You can expect to see fashion shows of the latest in wedding gowns, bridesmaid and grooms fashions. This will help you narrow your selection to the designers and colours that you like the most, before visiting your local bridal shop. Destination weddings are very popular and are a big part of our Spring show. You will be able to talk with sales teams from some of the best destinations. Pick up brochures, DVDs and speak directly with the wedding planners to get an idea of what your wedding might be like at that particular location. You’ll also find exciting honeymoon location ideas. Pick up brochures, business cards, and samples from those professionals and companies that appeal to you. When you get home you can look through the information at your convenience. Bridal magazines always have a section in their publications dedicated to budgeting. These charts and worksheets are helpful in setting a budget for your wedding. Meeting wedding companies in person and getting actual prices will give you a realistic idea of what your wedding will cost. So bring along your worksheets and planners to help with your planning. You will also want to make sure you get to the show early and grab yourself one of the 300 gift bags bursting with free goodies. The first 300 brides through the door will take home one of these amazing gift bags. The designer dress clearance sale room inside The Grand Wedding Show is always a popular place to visit, where you can try on gowns, take photos and see what styles might suit you. When you're there visit the New Zealand Weddings stand. Subscribe to the magazine and get a free Elizabeth Arden Always Red Femme fragrance, worth $89! The most important reason to attend a bridal show is to have fun! Take your mum, maid of honour, bridesmaids, friends– heck, bring the whole family and make a day out of it. WIN! We've got two double passes to the Grand Wedding Show to give away. Simply email your name, address and mobile phone number to [email protected] with GRAND WEDDING SHOW in the subject line.